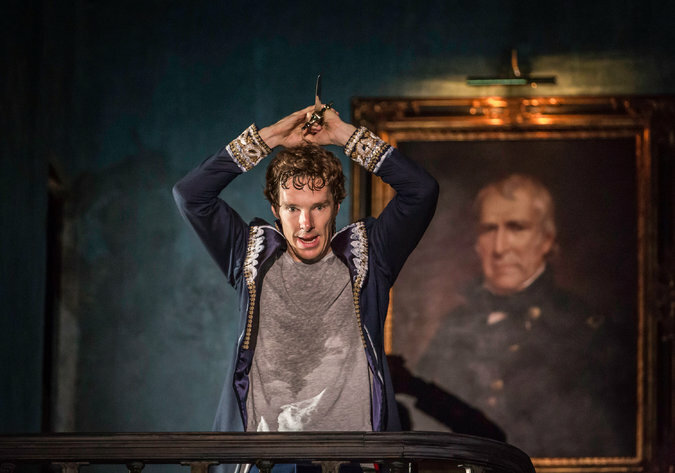 HAMLET at London’s National Theatre, broadcast live around the world and captured in Queens, NY, was thrilling. While no dramaturg was listed in the program or online, he or she had a large influence on this production, since a great deal of editing was done on the script, scenes re-arranged, as well as interesting combined characters. From the point of view of a filmed performance, I found only one flaw: one or two too many close-ups in what was clearly a beautifully staged production by director Lyndsey Turner. I want to see the actors in relation to one another and whatever was happening on the part of the stage the cameras weren’t showing me. But that’s minor. What I did see was scintillating theatre with fine acting in a coherent production of a great play. The dress is modern, the time not set, the formality of the address, and dress, and Elsinore itself tells us that this world is removed from ours no matter the year. The first scene on the ramparts was skipped and instead we are met by Benedict Cumberbatch’s Hamlet in front of the curtain, listening to a small phonograph play Nat King Cole’s rendition of “Nature Boy.” Hamlet weeps. Soon after Horatio enters, they jump ahead and right to the dinner scene, which is magnificently staged. A long table is sumptuously set parallel to the edge of the stage so we can see everybody, and here begins a conceit through the play: Hamlet comes forward (walking across the top of the table) and the action continues behind him silently, in slow motion, as Hamlet speaks directly to the audience. In this scene we meet the major players, including a Laertes who was clearly a friend of Hamlet’s, and who, loving his own father well, felt the sting of Claudius’ insensitive exhortations to Hamlet to forget his dead father. No words are exchanged between them, yet a relationship is clear, as is the relationship established in the next scene with Laertes’ sister. Kobna Holdbrook-Smith’s Laertes is not so self-absorbed here as he is often played, and is part of the court. Siân Brooke’s Ophelia is young and in love, and the relationship between her and her brother Laertes is solidified when they sit at the grand piano stage center and play a little ditty together. This follows through later, when the piano, amid the shambles that Elsinore becomes in the second half, is out of tune and harsh. Cumberbatch’s Hamlet is striking: he is in pain, he is in mourning. His mother Gertrude is oblivious to his pain and forgetful of her first husband since she’s so enamored of the second. And yet we see this Gertrude, as played by Anastasia Hille, is connected to the people around her, Ophelia in particular. Ciarán Hinds is a very good if cold Claudius. I saw no passion for Gertrude, just affection. He is a purely political animal. Gertrude‘s path through the play is succinct — no dallying while her first husband was alive, this woman sees the truth only when Hamlet shows her, and finally sees Claudius for who he is. When the Players present the play within the play, a small curtained stage is set up for the introduction of the Player King and Player Queen, then Hamlet, manic and sweating, plays Lucianus (nephew to Gonzago in the play within a play) himself. Later in his mother’s room, the same small curtained stage is used to hide Polonius behind the arras, which I found rather witty. Karl Johnson was effective both as the Ghost of King Hamlet and the Gravedigger. Morag Siller played a character comprised of Voltimand and Osric well, yet we miss the hilarity of a different sort of Osric. Jim Norton as Polonius was fine without standing out from many an old man, his lines deeply edited. Some of the cuts were too deep, I think, but the actors made the most of them. Particular points for the work of the powerful Anastasia Hille and poignant Siân Brooke. Act one ends with Claudius exhorting England to “Do it, England” meaning “the present death of Hamlet.” Then an autumn wind blows across the stage…. Light and wind made for some very nice effects joining the end of the first act and the beginning of the second. 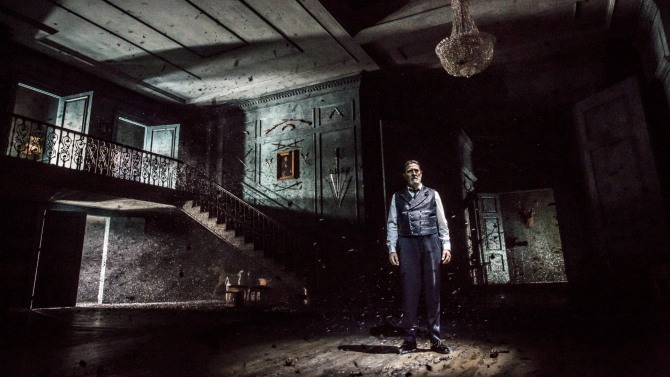 At the opening of the second half, detritus, dead leaves and dirt have been piled all over the stage, creating new levels of deterioration. When we see Ophelia in the first act, she carries about and uses a camera. In the second act, she drags a trunk banging down the stairs. Gertrude opens it when Ophelia exits and finds the trunk filled with torn black-and-white photographs and Ophelia’s camera. Seeing this, Gertrude knows what Ophelia is about and runs off after her, to no avail, of course. In the second half, the women are a bit less well coiffed and dressed, in synch with the trappings of power that droop dwindling on the stage. After Ophelia’s death, director Lindsey Turner created a lovely stage picture of Claudius rushing after the enraged Laertes, stopping at the top of the stairs to reach back for his wife. But Gertrude turns her back and walks away from him, barefoot through the dirt. This Gertrude had not thought for a moment that her first husband died an unnatural death, but finally sees her nation crumbling around her and knows that something is rotten in the state of Denmark. In the second half, Hamlet’s cry from Ophelia’s grave to Laertes, “I loved you ever,” is a reinforcement of the friendship that appeared at that dinner table in the first half. The fight scene is fabulous, beautifully staged by fight director Bret Yount and fought by highly skilled Hamlet and Laertes. It brought about swift death. All in all an effective rendering, but close-cropped to focus on Hamlet and the nuclear family at the expense of some of other characters. Although a slimmed down version of the play, this was a memorable Hamlet, produced by Sonia Friedman Productions. On the other hand, when it comes to the Roundabout Theatre Company production of Harold Pinter’s Old Times, I agree completely with my friend Horvendile’s blog about it at http://www.matthewslikelystory.blogspot.com/2015/10/old-times-or-you-pinter-you-brought-er.html. At the end of the thankfully brief performance, the first thing out of my mouth was “I don’t think that’s what Pinter meant.” That’s all. It was a fun evening, but it wasn’t … Pinter. Pinter is not about shouting and emoting; it’s about repressing. The play is under and between the lines. Pinter knew that shouting reduces the efficacy and impact of anger, diluting its power. Pinter must be underplayed. Director Douglas Hodge should know that, whatever his credentials. Surely the three wonderful British actors (Kelly Reilly, Clive Owen, and Eve Best) must know that. As for the rest, the immediate assault by light (Japhy Weiderman) and sound (Clive Goodwin) started us off poorly. The set design by Christine Jones was quirky and odd and I did wonder if it signified being at the edge of the world….perhaps a bit distracting. While costumes by Constance Hoffman were fitting, music was ill-chosen by Thom Yorke. This is not to say I’m not glad I saw it. I’m glad. But it wasn’t …. Pinter. ~ Molly Matera, signing off, recommending National Theatre’s HAMLET (still playing at select theatres, see http://ntlive.nationaltheatre.org.uk/) and not so much the Roundabout Old Times.